At NAB, Canon announced and demonstrated a new C-Log option for the 5D Mark IV camera. This brings the 5DIV into the Canon cinema camera world with a matching log-type output stream that puts about 12 stops of dynamic range into a gradable video clip. The dynamic range is optimized at ISO 400, by the way; below and above that you might not get the full 12 stops. 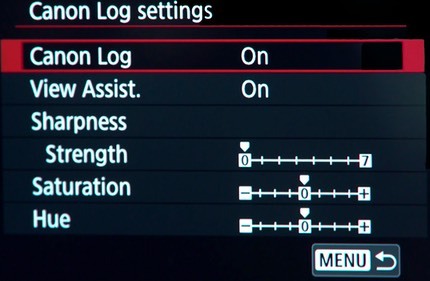 Along with the addition of C-Log, a new menu of options is provided, including the ability to alter the sharpening, saturation, and hue settings being used by the control. The C-Log option requires you to send your camera back to Canon or an official service center for a slight modification, and costs US$99. The service should be available in July.